Copper bracelets and magnet wrist straps have no real effect on pain, swelling, or disease progression in rheumatoid arthritis, according to new findings from a study conducted at the University of York. In the first randomised controlled trial to study the effects of copper bracelets and magnetic wrist straps on rheumatoid arthritis, 70 patients with active symptoms each wore four different devices over a five-month period, reporting on their pain, disability, and medication use throughout the study. Participants also provided blood samples, after wearing each device for five weeks, in order to monitor changes in inflammation. The research published in PLOS ONE, show that both the standard magnetic wrist strap and the copper bracelet provided no meaningful therapeutic effects beyond those of a placebo, which was not magnetic and did not contain copper. If you must wear them as a decoration that’s fine but if for so-called health benefits, unfortunately it’s no better than placebo. We’d like to issue another stark reminder – herbal diet and weight loss supplements have been reported over and over again to have caused liver damage. These products are being marketed as food supplements and there is no regulatory control over them like medicines, yet they are being consumed for purported health benefits e.g. slimming and weight loss. This is most unfortunate as far from being “natural” and “safe” which the public are being led to believe, there have been serious adverse effects associated with these products. Dietary supplements, which are also referred to as health supplements, include herbal products, vitamins, minerals, and any product that is not being marketed as a food or drug (medication). People take dietary supplements with the idea of maintaining or improving their health. Recently, however, my colleagues and I reported in a medical journal a series of seven patients who were referred to us with severe liver injury. They developed the liver damage after taking a health supplement called Lipokinetix® to lose weight. This supplement is a mixture of chemicals that includes an extract from a particular tea. It is said to reduce weight by working to mimic exercise and increase metabolism. How and why can dietary supplements damage the liver? Within three months of starting Lipokinetix, these seven patients developed symptoms of acute hepatitis, including tiredness, loss of appetite, and abdominal pain. They sought medical attention and their blood tests revealed severe liver damage. One of the patients actually developed acute (rapid) liver failure and almost required a liver transplant to save her life. After being in a coma for three days, she miraculously recovered and was able to leave the hospital. Indeed, in all seven patients, the symptoms disappeared and the liver tests returned to normal within several months after discontinuing Lipokinetix. That said, I have since been informed of another individual who took this same supplement, developed acute liver failure, and did require a liver transplant. She is doing well now. However, so that her body can continue to accept the new (foreign) liver, she will be taking powerful anti-rejection medications for the rest of her life. But that’s not all! Numerous instances have been reported in the medical literature of dietary supplements, especially herbal products, causing liver damage. These supplements include kava (which has received much recent coverage in the press), Jin Bu Huan, germander, chaparral, shark cartilage, and mistletoe, to name a few. Dietary supplements can cause liver injury in a number of different ways. In some instances, for example with kava, liver injury is dose-related. That is, the higher the dose, the more often liver damage occurs. In many instances, however, liver injury is an unpredictable peculiarity in an individual (an idiosyncratic reaction). It is well known that people often take combinations of herbal and/or other dietary supplements. In this circumstance, if a person develops severe liver injury, identifying which supplement is the specific culprit is very difficult. What’s more, as the dietary supplement market becomes more competitive, the manufacturers of supplements are mixing and matching their products and doing so in proportions that have never before been tried. A case in point is the above-mentioned Lipokinetix, which contains among its ingredients an ephedrine-like stimulant, a type of thyroid hormone, and the tea extract. Hepatic injury in 12 patients taking the herbal weight loss AIDS Chaso or Onshido. Do you really need supplements? If you are not sick or have special nutritional needs, you probably do not. It is best to eat a balanced diet with emphasis on fruits and vegetables. So called dietary supplements being marketed have no additional health benefits despite what the marketeers are touting. Indeed on occasion they may be harmful to your health. The scent of suspicious activities reeked as we entered Bioresonance Health Solutions Center, operating in a three-storey building in Pekeliling Business Centre. The signage was small and didn’t reflect a proper health facility where dozens of patients visit daily. We took the elevator to the second floor where the Bioresonance treatment and consultation takes place. On the right was the room of the “mind-reading doctor” where a man probably — in his 40s — had wires and electron cables attached to him. A laptop seemed like it was reading the man’s “microwave pulse”. The man, obviously a patient, looked like a lab rat but the only difference was he probably volunteered to do it. In the waiting area there were about 10 people, some of whom came for treatment or consultation. There was another treatment room where another person was also strapped to another machine. There was no business registration, doctor’s accreditation or certificates in the premises. Rates on the treatment and consultation were pasted on the wall on the second floor together with the Cool Sauna service rates which allegedly can cure skin diseases and helps with weight loss. There were only three bioresonance machines, one which we were told was out of order. Staff-wise, there were two female front-desk employees and another man in his 20s who was manning the bioresonance machines. During our 90-minute visit, we observed that some patients were strapped to the machine for 15 minutes while some were on for almost 40 minutes. Conversations with several patients, who said they heard of the “magic healthcare centre” through word of mouth, added to our suspicions. Their testimonies of how they were speedily recovering from ailments such as cancer, stroke and ulcers were too good to be true. Their tales left us thinking that some had been planted there to praise the treatment and the “doctor” to convince first-time visitors of the power of bioresonance. What does the MOH have to say? Well, they say bioresonance treatment not recognised in Malaysia but when asked what action the T&CM Division could take against errant practitioners Dr Rimah said “they could only investigate and pass the information to the relevant authorities such as Companies Commission of Malaysia, Immigration Department and the police”. When the MOH chooses to walk on the slippery slope of supporting TCM, you can expect all sorts of charlatans to walk the same path. A randomized, double-blind trial of bioresonance in the treatment of atopic dermatitis in children showed no efficacy. Clinical trials evaluating electrodermal testing show no reliability in diagnosing allergies. The Food and Drug Administration has prosecuted numerous purveyors of electrical devices for making unsubstantiated health benefit claims. The American Cancer Society advises patients not to seek treatment with unproved electronic devices. Another “Miracle surgery” scam in Malaysia? There’s a good article over in the Star: Unconvinced by medical evidence which highlights the problem of despite there being sound medical evidence, there are people out there who to the contrary believe otherwise and either use “Alternatives to medicine” or believe in disproven notions like Vaccines cause autism. The question is why? The human mind is mysterious indeed. I’m writing to you from Canada. me the article about the warning you wrote about back in July. so that my mother can read it? She does not understand English. Thanks so much in advance for your help. We hear you, and we’ve added the Transposh Translate filter – this is a drop down box in the right hand column and you can select one of the available languages : Chinese, Japanese and Bahasa Melayu. Schools in several states have been “pushing” pills that supposedly make pupils cleverer. The promoters also claim that the “get smart” pills, named Dimensi 108, which are marketed as food supplements, can alter children’s behaviour to make them more obedient and hard-working as well as resistant to illnesses. Concerned parents from a school in Kuala Lumpur contacted The Star when the tablets were distributed to Year Six pupils earlier this week, saying their children were being forced to buy the pills. One parent said she had asked her daughter to return the pills to the class teacher and refused to pay for them. “When my daughter and a few of her friends returned the pills, the teacher told them not to blame her if they are tak pandai (not clever) in their UPSR (which starts on Sept 9). “Can you believe that? The teacher is supposed to encourage the kids to work hard for their exams and not rely on some pills with so-called magical properties,’’ the outraged parent told The Star. Another complainant, whose brother is studying at the school, has lodged a written complaint with the Health Ministry. “A ministry official told me that they will look into the matter, and I have also sent pictures of the packaging of the pills with the ministry’s logo on it. “I hope they will get to the bottom of this as quickly as possible because we need to know whether the product is legitimate or not,” said the complainant. The school’s headmistress said parents had “misunderstood” the nature of the pills and it was not compulsory for pupils to buy them. “We would not promote anything that is bad for the pupils … these are just like herbal supplements to help pupils concentrate and build energy for the upcoming examination. “They have ingredients such as spirulina and red dates, which are known for their health-giving properties. I myself give them to my child near the examination period. “The product also has the endorsement of the Malaysian Federation of the Council of Headmasters, meaning that it has been approved by the Health and Education ministries,” she said. The headmistress claimed that the pills were supplied to the school by the council. Not only is it unethical for teachers to be pushing health products onto schoolkids, it’s downright misguided. It’s the same old “just because it’s herbal means it’s natural and that means it’s safe and good for you’ fallacy. It’s also the same “it’s good for you” hard sell without any real evidence to back up their claims. Endorsement by the Health ministry? If there is any endorsement it may mean only registration as a food supplement and no endorsement as to a ‘miracle mental pill’. The only thing these pills are definitely good for are the bank balance of those who push them. There is no short cut to good health – mental and physical – and that is a balanced diet, lots of fruits and veggies in particular, exercise, adequate sleep. No, hyperbaric oxygen therapy (HBOT) has not been clinically proven to cure or be effective in the treatment of cancer, autism, or diabetes. But do a quick search on the Internet, and you’ll see all kinds of claims for these and other diseases for which the device has not been cleared or approved by FDA. HBOT involves breathing oxygen in a pressurized chamber. The Food and Drug Administration (FDA) has cleared hyperbaric chambers for certain medical uses, such as treating decompression sickness suffered by divers. HBOT has not, however, been proven to be the kind of universal treatment it has been touted to be on some Internet sites. FDA is concerned that some claims made by treatment centers using HBOT may give consumers a wrong impression that could ultimately endanger their health. Patel says that FDA has received 27 complaints from consumers and health care professionals over the past three years about treatment centers promoting the hyperbaric chamber for uses not cleared by the agency. Thirteen uses of a hyperbaric chamber for HBOT have been cleared by FDA. They include treatment of air or gas embolism (dangerous “bubbles” in the bloodstream that obstruct circulation), carbon monoxide poisoning, decompression sickness (often known by divers as “the bends”), and thermal burns (caused by heat or fire). A patient of mine recently brought a leaflet advertising “foot detoxifcation” asking me if it will help her illness. They even have a website which denies their product is a scam. 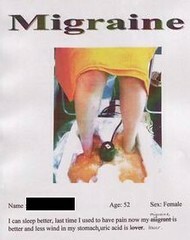 However, while one section of the website states that “As a company we do not claim that we can cure disease by soaking the feet in water”, another section of the website has the usual “testimonials” of people with various “disorders” like migraine (see pic), kulit gatal-gatal and even “severe gout” allegedly obtaining benefit from its use. People, a scam is a scam is a scam. Surely you cannot be so gullible to believe that by soaking your feet in this contraption your body will be “detoxified”? The public may be swayed by the water “miraculously” turning brown or black in colour. The scam vendors advertised these devices as aqua chi machine, bio electrical biofeedback machine, foot spa, energy spa, super detox foot bath . They also advertise the scam as a service such as bio-detox, aqua detox, aqua spa, emerald detox, platinum detox. In essence, the foot bath contains a low voltage/amperage AC to DC transformer attached to ferrous electrodes. The process is basically electrolysis of water, a typical high school experiment, with a twist. The brown “toxins” you see is from the rust generated by the corrosion of the iron electrodes. The different variations in color can be accounted by varying amount of salt added to the water and variations in the compositions of the electrodes. It’s a simple chemical reaction folks. Don’t be gullible and fall for this BS! Many skeptics suspected that the color change produced by the Aqua Detox was caused by rust (oxidized iron), rather than toxins. Ben Goldacre, who writes the “bad science” column for Guardian Unlimited (an online British newspaper), investigated by using a car battery to send current through two metal nails that he placed into a bowl of salt water. The water turned brown and developed some sludge on top. Then he sent a colleague to get “detoxed” and collect before-and-after water samples. Laboratory testing showed that in both cases, the change of water color was due to greatly increased iron content . Thus it appears that (a) the color change is due mainly to the precipitation of rust created by corrosion of the electrodes, and (b) the water would change color regardless of whether or not a foot was placed in it.